Meditation is simply the experience of the limitless nature of the mind when it ceases to be domineered by chatter. The mind can be naturally calm, clear and serene. Meditation has been practiced in many cultures for thousands of years. Modern science is now discovering just how beneficial meditation is for our mental and physical health. Thoughts and emotions are linked to our everyday lives. With meditative skills, emotions can simply pass through the mind, allowing us to discover a sense of unity and connection with ourselves, others and nature. We become more aware, more sensitive and more accepting. 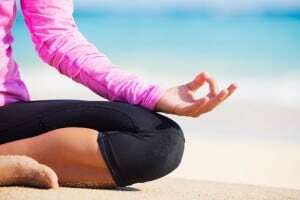 Most meditation classes include a variety of techniques such as body awareness, breath awareness, counting the breath, using mantras, guided meditation, relaxation techniques, stillness practice, and the use of candlelight and sound. A variety of styles are on offer to help you find one that suits you. The classes are suitable for all levels of ability and experience. A sacred space is created to facilitate a deep experience of meditation. Our Meditation teachers are highly trained, accredited and experienced. Remember that it is normal to take some time when learning to meditate. The objective of meditation is to disclose the Self within by peeling away what obstructs it. Know that it is a subtle process so patience helps! It is not about right or wrong technique, it is natural for the mind to wander during beginner’s meditation. With practice, your mind will become calmer, stiller and you will be more serene. We currently offer Qi Gong classes only (which has a meditative component). Please contact us to express your interest in a meditation class, if there is enough demand we will recommence them..